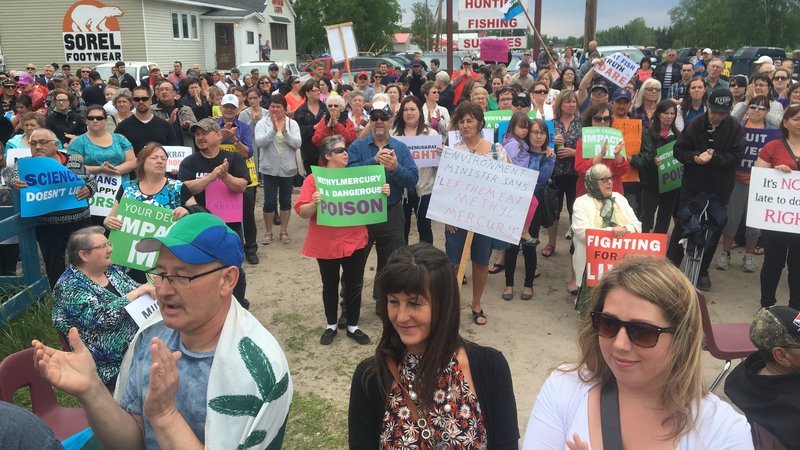 Leaders of the three Labrador Indigenous groups joined hundreds of protesters Monday in Happy Valley-Goose Bay demanding Premier Dwight Ball halt construction of the Muskrat Falls hydroelectric project. It marked the first time all three groups have come together in a unified voice on an issue. The Indigenous groups, and those gathered, believe unless further work is done to mitigate the environmental impacts of the dam before it goes on stream it could contaminate aquatic life in Lake Melville, a major food source of fish, birds and seals for many Labradorians. Cars drove by honking in support of the rally as Nunatsiavut President Johannes Lampe invited the Indigenous groups at the rally and all Labradorians to take part in fighting against the development. “We are not interested in compensation, we want to enjoy our way of life, we want our children, grandchildren, and future generations to come to enjoy this way of life. We don’t want them to fear eating the fish, birds and seals in Lake Melville,” said Lampe. Make Muskrat Right has been the campaign of the anti-hydro protesters for months. The Indigenous groups say they were misled by the provincial energy company, Nalcor, and that more recent independent research conducted by Harvard University conflicts with Nalcor’s findings that the Muskrat Falls project will not significantly raise levels of methyl mercury in the surrounding waters. The Harvard study said that unless Nalcor clear cuts the dam’s basin before it is flooded, it will cause methyl mercury levels in the surrounding waters to rise. This potential contamination includes nearby Lake Melville, where many Indigenous people and Labradorians fish, hunt and gather. Nalcor responded by saying that environmental monitoring of mercury levels and possible compensation is the best way to protect people in Labrador. Carlene Palliser, from the Inuit community of Rigolet, traveled across Lake Melville by ferry to reach the protest. Her community is downstream from the development and she is concerned about the future for her children and grandson. 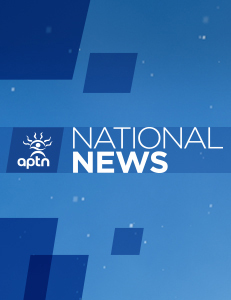 Labrador Innu Nation Grand Chief Anastasia Qupee said thorough assessment and preventative work, and not mitigation afterwards, is the only way forward if the government wants the continued support of the Innu. 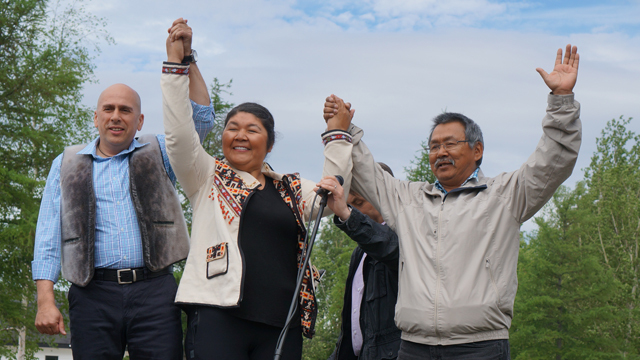 While the two Inuit groups, Nunatsiavut and NunatuKavut, have opposed the project since construction began, the Innu signed an Impact Benefit Agreement with Nalcor and the province. They say the conflicting information about increased methyl mercury levels were not included in their negotiations with the provincial energy company. Had they known it would acted differently. The impact of Muskrat Fall’s tab is being felt the province. Last week, it was announced the project is years behind schedule and its price tag has ballooned from $7 billion in 2012 to $11.4 billion in 2016. Nalcor CEO Stan Marshall admitted the project was a “Boondoggle” and “not the solution to the province’s energy needs.” Debt from the project is expected double current electricity rates in the province. One of the project’s most vocal critics, 77-year-old NunatuKavut elder Jim Learning, was absent for the rally. Learning has been to almost every rally so far and arrested a number of times for protesting against the development. Learning is in St. John’s now receiving radiation treatment for cancer. He said while he may not live to see Muskrat Falls shut down, or at least mitigated, he has hope for the people of Labrador to see them united. 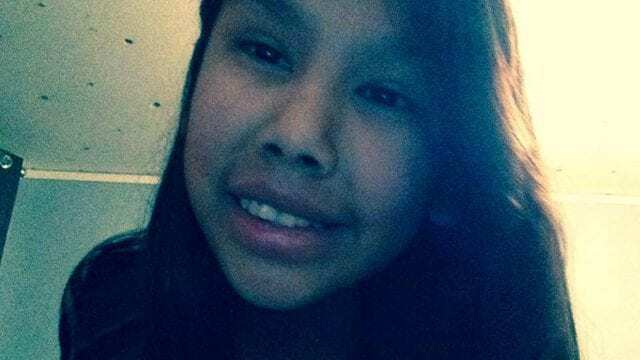 Nalcor had originally stated that the dam would go online between 2017 and 2018, that date has been pushed back to at least 2020, not factoring in a possible clear cutting of the flood basin and other factors to mitigate environmental damage that the Indigenous groups want to see.